There are two species of orangutans found in the world: Bornean and Sumatran and they are named after their differing locations. Both of these species have been facing problems with the destruction of their habitats which have caused problems with population growth. Although the habitat and distribution of orangutans varies slightly between species, both types choose to live in tropical forest. In these forests, the temperature usually remains close to 23 degrees Celsius (73.4 degrees Fahrenheit). These areas will normally have approximately 12 hours of daylight each day but the amount of rainfall can vary between the tropical forests where orangutans are found. As mentioned earlier, the habitat and distribution of orangutans will vary between the two species. Historically, it was possible to find Sumatran orangutans covering the whole island of Sumatra in addition to some of them entering Java. Bornean orangutans also had a wide range of habitat and distribution on Borneo including Sarawak and Sabah in Malaysia and Kalimantan in Indonesia. Both species have faced great decreases in numbers, habitat and distribution due to human actions such as logging and mining which destroy their habitats and in turn, deplete their numbers and lower their range of distribution. 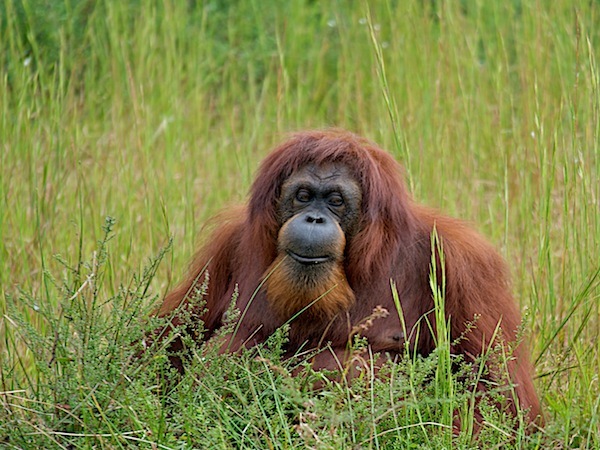 The Sumatran orangutans have had a dramatic reduction in numbers. Orangutan sitting in the grass. Although the habitat and distribution of Sumatran orangutans used to cover a wide area, today they are only found in the northern areas of Sumatra. Scientists estimate that their current population is around 7,300 which is divided into 13 populations. These numbers have greatly reduced over the years as the population decreased by over 50% between 1992 and 2000. The habitat and distribution of these 13 populations leads to concerns for the future as despite there being 13 current populations, only 7 are believed to be able to survive in the long term (based on having over 250 orangutans). This is mostly due to habitat destruction because of logging. The three populations with the largest numbers (over 1,000) can be found within the Leuser Ecosystem which is a large area of forest found on the northern area of the island but that is facing many habitat threats. Despite the low numbers of habitat and distribution in certain areas, some populations that live where habitat loss is not occurring as quickly may have better chances of survival. Like the Sumatran orangutan, the habitat and distribution of the Bornean orangutan has greatly declined in recent decades, mostly due to the loss of habitats due to habitat destruction. Possibly one of the worst events in the recent history of these orangutans was in 1997 and 1998 when forest fires occurred in Kalimantan and killed around 8,000 orangutans. In the last 60 years, the populations distributed throughout their area have decreased by over 50%, which is not a surprising number as within the last 20 years their habitats have been reduced by over 55%. Because of the destruction of their habitats in other areas, today most of the habitat and distribution of Bornean orangutans can be found in Kalimantan which is the area with the largest forests still available. However, while some of the populations can be found within protected areas, the majority is not which puts them at risk of losing their habitats. One of the subspecies of Bornean orangutans, P. p. wurmbii, is mostly found in Central Kalimantan in the swamp and lowland forests and has over 35,000 orangutans. The most endangered one, however, P. p. pygmaeus, only has around 1,500 in Danau Sentarum which used to be their main location.